But you wanna know JUST how much I heart you? I heart you so much that when I made these pancakes and layered them with my eggfruit pudding, that I felt bad for rubbing it in your face that I have eggfruit pudding and you don’t. Oh wait, I didn’t just say that. Especially since when I made them a second time, layered them with whipped cottage cheese, but then I realized they were a bit dry. Oh snap…there I go again. Sorry. During a bout of insomnia the other night…I got in the kitchen determined to perfect these lil’ cakes. If that’s not true hearting then I don’t know what is! *If using regular flour instead, omit one egg white. 1. Heat a non-stick skillet or griddle to medium heat and coat with cooking spray. 2. In a medium-sized bowl, combine flour, protein powder, and baking powder and stir to mix. 3. In a separate bowl, whisk egg whites until frothy (about 5-6 seconds) then add “riced” cauliflower, apple sauce, and almond milk and stir to combine. 5. Spoon batter onto skillet forming 3 medium-sized pancakes and cook 5-6 minutes per side (batter will not bubble). 6. Serve layered with pomegranate cream, pomegranate seeds, and coconut flakes. 1. Combine ingredients in a small blender and blend until smooth. Do you have any plans for Valentine’s Day this week? The man-friend and I are planning a trip to Memphis over the weekend! And I’m really hoping we get a chance to eat HERE! How do you show someone you “heart” them? 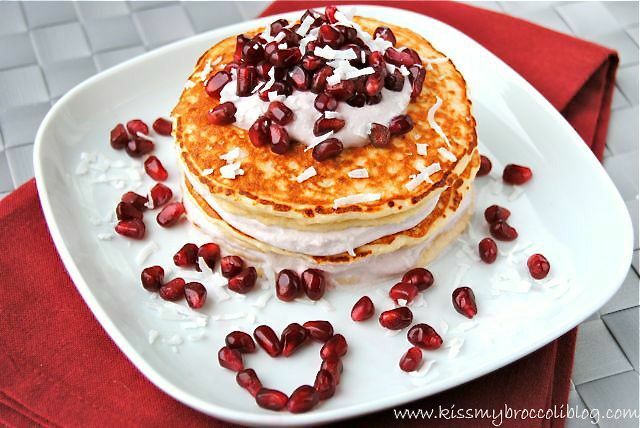 This entry was posted in Breakfast, Pancake Sunday, Strange But Good and tagged cauliflower, coconut, coconut flour, eggs, oats, pancakes, pomegranate, protein powder. Bookmark the permalink. Awwww so much love you spent all that time making the heart for us 😉 we all love ya back! 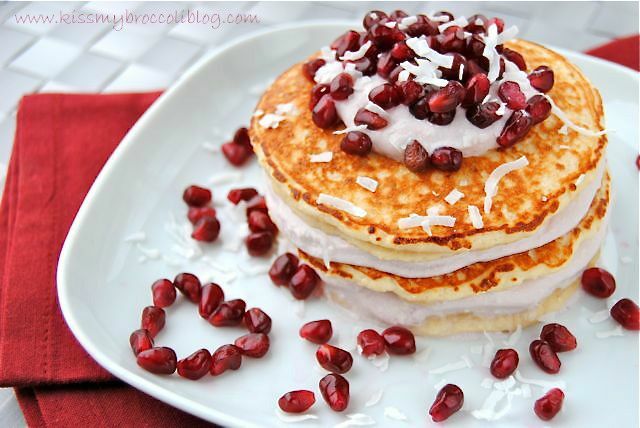 Adding cauliflower to pancakes, so interesting! First time I have ever seen that! 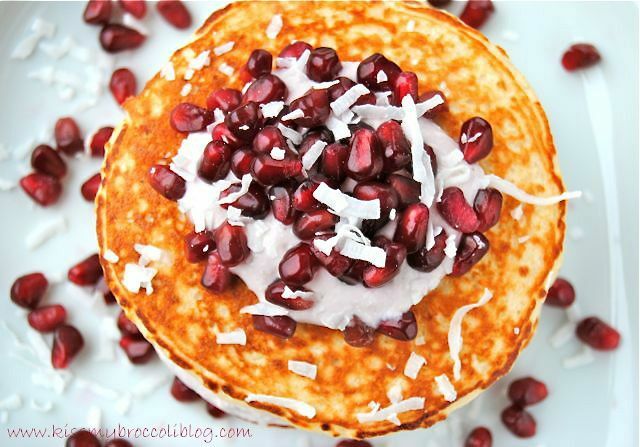 They loo fab, as your pancakes always do! Well these LOOK absolutely fantastic, but I have to be honest and say the idea of eating cauliflower first thing in the morning kind of skeeves me out 😯 I’d have no problem eating them for lunch or dinner, though, especially if you came to cook for me and didn’t tell me what was going in them 😉 And I’m with you on cooking and gift giving being great ways to show someone that you care about them. That and just being able to give someone your time/support/attention are all good in my books. 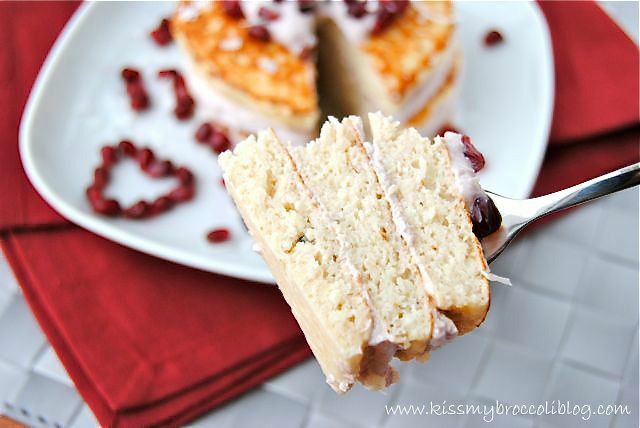 Oh girl, with as much as you make pancakes, it will truly change your life! Just one tablespoon takes a regular pancake to a panCAKE just like that! I swear it’s one of my most used flours! Do it! Nom nom nom!!! these look delicious – i have a huge tub of riced cauliflower just waiting for me in the fridge; definitely think i’ll be using some of it to make these! Awesome! You have to let me know what you think! But I’m sure you will LOVE them since I just spied your cauliflower pudding! I tried to leave a comment, but your bloggy doesn’t like me right now! I’ve still got some leftovers too so I’ve GOT to find the time this week to try your recipe! Cauliflower??? These should have been you Strange But Good. LOL! cauliflower in pancakes?! you are just too much for me girl, i love it! And i love how fluffy these babies look! Hey Heather – Had to swing over from your Instagram feed to find this pancake recipe. Like the others, let me just say, Cauliflower?? Well, I have some leftover from my last CSA box, so this should be a good way to use it! Very clever. OK – those are just amazing! I love you back Sweetheart ! Gosh, I love these. And since I am endlessly stucked and obsessed with whipped cottage cheese, how perfect are they for meeee?? Isn’t it sad that we don’t celebrate Valentines Day here? Well I think I just create a valentine Sunday coming weekend doing these babies. I give wet kisses on cheeks when I heart someone. Not always wet, but a lot- and definitely kiss the cheeks of my loved ones permanently So you know, I warned you. Your pancakes are always amazing!! For Valentine’s Day I am cooking for my husband, then the day after I am planning to go to a painting studio with a friend whose husband is deployed. On Saturday hubby and I have a dinner to go to and the followin g week a dinner/dance! All Valentine’s related!! I can’t believe adding the cauliflower has them turning out so beautifully! I never would’ve imagines that! I kind of like it though! I have no plans for Valentine’s Day – I’ll probably end up having a movie night with myself (plus chocolate!) haha. Oh my gosh, YES!! Pancake dates will be a MUST!! My fingers have been crossed for months! You find out next month, right? Ummm, if you really truly hearted me, I think you’d make these for me. 😉 They look great! 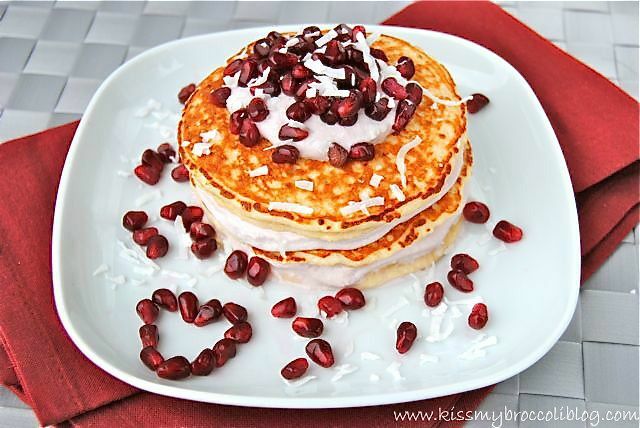 These look fantastic and how cute is the pomegranate heart!! 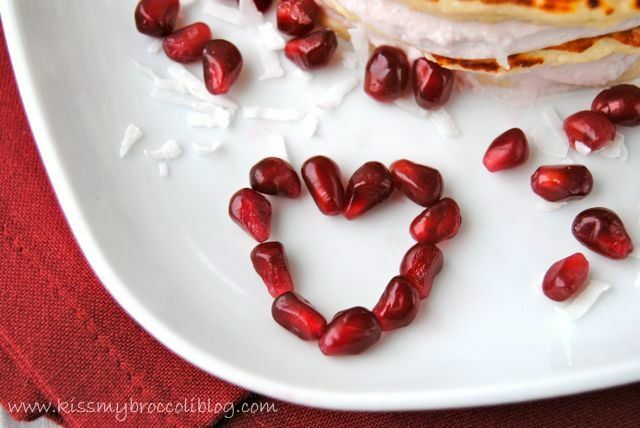 Love the pomegranate hearts! And cauliflower was the last ingredient I would have guessed… so creative! I can see it’s flavor being pretty well hidden. 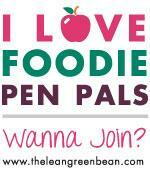 I’m linking up some V-day recipes on Wednesday, is it okay if I include yours? I am feelin’ the L-O-V-E!! If spending five minutes on pomegranate heart construction isn’t true gushy love, I’m not sure what is! Adding cauliflower to my cakes sounds like it might be a tiny step outside my comfort zone, but I think I’ll be able to muster enough strength to walk on the wild side. Can you *really* not tell it’s in there? I swear on my weird foodie heart…can’t taste it AT ALL!! You seriously have to try it to believe it! VERY NEW GUY?! How is this the first I’m hearing of this?!? Spill! But… Will continue on as the batter was SOOOO freaking nice! Thinking of putting it in a ramekin and baking it… Thoughts? Aww, I’m so sorry to hear you had problems with the pancakes turning out! This recipe gave me a little trouble in creating…we’re talking SIX batches in all 😯 …so I feel I know the in’s and out’s of them pretty well. Hmm, did you use sweetened or unsweetened applesauce? One problem I ran into (and you wouldn’t really think it would make that much of a difference) is that with sweetened applesauce, the sugar in it tends to want to caramelize as the cakes are cooking which can cause it to stick a bit. Other than that, I would just recommend using a medium heat setting and waiting until you start to see the sides crisp up before flipping (the raw batter side of the cake will start to look kind of waxy or dry…that’s when you know it’s ready). Funny you should mention baking it because I actually did a few experiments with it in baking. It needs a bit more protein powder to “set” and a little extra sweetener, but definitely worth trying out! I still want to get in the kitchen and try a few more things, but I hope to have a recipe on it in the future! 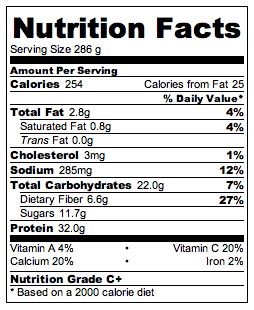 My protein powder also has zero fat and carbs, perhaps that contributed to it hehehe!! Oh that would be AWESOME! I really hope the changes help…the steamed apple puree might not have had enough liquid to them and I know that protein powders can be a bit tricky at times. I used a vegan one once in a recipe I had already made perfectly TWICE and they came out horrible…crisp and golden brown on the outside, but completely RAW on the inside! One of the ONLY times I’ve ever thrown a pancake away!